Looking to Plan a Trip in the North East? There’s a Festival in Manipur this October that You Cannot Miss! Looking for a unique spin to your trip in the hills? The universe and the rich culture of the North East have caused the next two months to be the perfect time for travel to Manipur. The Mera Houchongba festival is due to take place this October, and nothing encapsulates the magic of Manipur like a celebration of its culture. Mera Houchongba is a culture of festivity that has been bred since time immemorial. First celebrated in the presence of the God King, Nongda Lairen Pakhangba, back in the first century, this festival has only gained momentum since then. Initially, it was observed in Lampak, but since 1891, it is being celebrated in Imphal. Needless to say, the heritage value of the festival is immense and is symbolic of the rich culture that has been preserved over the ages. Manipur is known for housing various indigenous communities in a harmonious manner and the Mera Houchongba is a testament to this very statement. In fact, at its very core, it seeks to celebrate the unity of these diverse ethnic groups and their ability to coexist peacefully. Such a vivid celebration of diversity is bound to attract anyone with an appreciation for culture. The festival, organised by Mera Hou Chongba Thoushil Lup, observes exchange of presents – which include traditional mementos and savouries – and many performances. The royal palace officials share the same dias as the multiple village chiefs from communities such as the Mao, Kabui, Zeme, Kom, Liangmei, and many more. The locals are dressed to the nines in their traditional attires and are enthusiastic participants of all the festivities. The reason why the best time to visit Manipur is during Mera Houchongba is because of its representation of the Manipuri spirit. 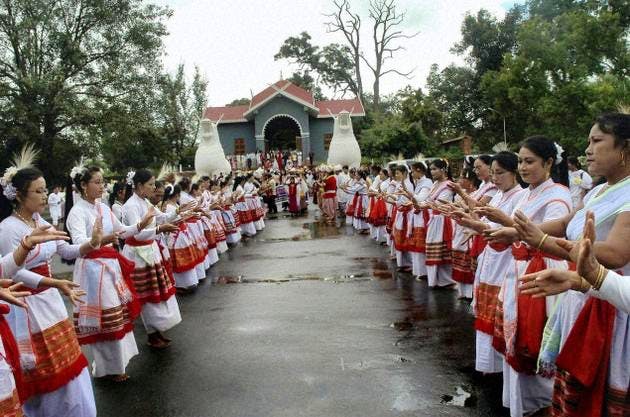 It is a known fact that Manipur has been founded on the principles of diversity and pluralism, and the Mera Houchongba celebrates this very fact. Thus, to truly feel the vibe of the place and its people, one must visit Manipur during Mera Houchongba.